“The Giant of Santa Ursula” in southern Mexico City turns 50 next year. Ever since it was opened, it’s been one of the largest stadiums worldwide and the majestic concrete structure still amazes. But its sheer size makes the stadium a burden for renovation works. Even the recent replacement of all seats had to be carried out in several phases with the immense number. Which, we should note, now stands at 95,500 rather than most commonly quoted 105,000, as confirmed by the stadium’s director of operations. This means Azteca isn’t the world’s largest stadium with individual seats, but second largest after Camp Nou. Upcoming years are most likely to see changes much larger than just installation of new seats. The stadium, owned by private TV company Grupo Televisa, will become the heart of a new commercial hub. A new scheme called Foro Azteca will be implemented west of the stadium with 130,000 of retail space, 20,000 sqm of offices and two hotels. All of these elements will be joined by new leisure spaces and parking for 2,500 cars. Not without a reason – the complex is going to consume large parts of the current parking and nearly all of Parque Santa Ursula, largest public green location in the vicinity. As the investment is private, cost and time frame are not yet clear. However Grupo Televisa was reported to approve one bid from joint-venture of IQR and Alhel. The two developers are specialized in shopping centers (IQR) and offices (Alhel). Reportedly their concept is presented in the below images. It should be noted that no planning application was filed yet and works on design are understood to be preliminary. 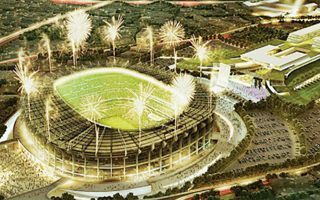 The stadium itself is expected to receive a renovation as well as part of the scheme, however the extent of works is unclear.